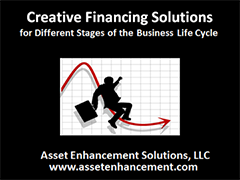 Asset Enhancement Solutions, LLC has arranged over $250 million in financing for privately held and public companies to solve unfavorable challenges such as financial, operational or liquidity issues and positive challenges such as satisfying opportunities for rapid growth and expansion. Learn about the Creative Financing Solutions we arranged for many different types of Financing Challenges by reading our Success Stories. Find out how we can arrange the appropriate type of Debt & Equity Financing to solve your Financing Challenge.